In an important industry milestone, Mastercard today unveiled the foundation for the future of commerce with the new Masterpass global digital payment service. This enhanced solution enables consumers to look no further than their own trusted bank or credit union to make fast, simple and secure digital payments – across devices and channels – anywhere they want to shop be it online, in app and now in-store with contactless. Mastercard is the first network to deliver an omni-channel, all-digital payment service for consumers, issuers and merchants leveraging the most advanced methods of payment security available today. From purchasing a train ticket from your mobile device, to splitting and paying your restaurant bill right at the table, to buying your groceries with the tap of your phone in-store and booking a flight online, Masterpass simplifies the checkout experience. Masterpass is currently available at hundreds of thousands of merchants online or in-app including Masabi, Office Depot and ParkMobile. Consumers will now be able to use Masterpass at the more than five million merchant locations in 77 countries that accept contactless payments including BJ’s Wholesale Club. 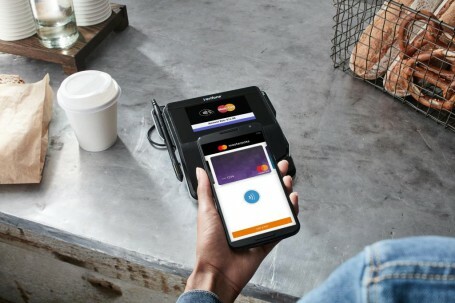 Contactless capability will first be available to Android device owners in the U.S.
Merchants who will deploy Masterpass in the coming months include Saks.com, Lord and Taylor.com and The Cheesecake Factory in-app. Masterpass uniquely empowers issuing partners to deliver a bank-branded, all-digital payment solution. More than 80 million accounts will be automatically enabled through issuing partners as the service rolls out globally. The enhanced digital payment functionality helps issuers differentiate existing products, including mobile banking apps, by integrating digital payment functionality and new services like purchase alerts and paying with points. The initial partners supporting the enhanced Masterpass experience include Ally Bank, Associated, Bank of America, Bank of the West, BMO Harris Bank, Capital One, Central Bank, Citi, Fifth Third Bank, First Hawaiian Bank, First Tech Federal Credit Union, Key Bank, People’s United Bank, Security Services Federal Credit Union, SunTrust and Virginia Credit Union. By layering services including tokenization with bank identification and verification of cardholders, Masterpass uses the most advanced security methods today to protect consumers from fraud. The rollout of Masterpass-enabled solutions from issuers in the U.S. begins later this month. Europe and the Middle East/Africa will be the next markets where the converged Masterpass solution will be live by the end of 2016. Additional rollout of the enhanced Masterpass service in North America, Europe, Latin America & the Caribbean, Middle East & Africa and Asia Pacific will continue through 2016 and in to 2017. The digitization of commerce processes and increased connectivity of consumers is driving a digital transformation that will provide seamless payment choices. To reflect a readiness and optimism about this transformation, Mastercard is introducing an evolution of its brand identity – simplified, modernized and optimized for an increasingly digital world. The brand identity starts with a new brand mark, and plays out in a holistic design system that will bring a forward-thinking, sophisticated and inclusive brand expression to every touch point around the world. The evolved brand identity, including the most comprehensive brand design system ever introduced globally within Mastercard, will be rolled out to all Mastercard products, communications, and experiences, starting with Masterpass later this month, and across Mastercard beginning in the fall. The Masterpass vision is to support all forms of commerce in order to address the widest range of merchant experiences and consumer needs. Masterpass stores all payment information, including card details from both Mastercard and other payment networks, shipping information, and payment preferences in one convenient, secure place. With Masterpass, you can check out online or in merchant apps by simply clicking the Masterpass button and authenticating to complete the transaction. In-store, simply tap to pay at contactless-enabled merchants and get on your way. Masterpass also leverages the most advanced methods of payment security available today, including network tokenization, which ensures information is protected. Masterpass allows issuers to design and develop their own branded digital payment solution using Masterpass APIs and SDKs, while merchants can use Masterpass APIs and SDKs to enable checkout online and within mobile apps. Masterpass is currently available in 33 markets globally, with plans to expand to three more by the end of the year. For a list of Masterpass online and in-app accepting merchants visit www.masterpass.com. In-store enabled merchants can be found here.